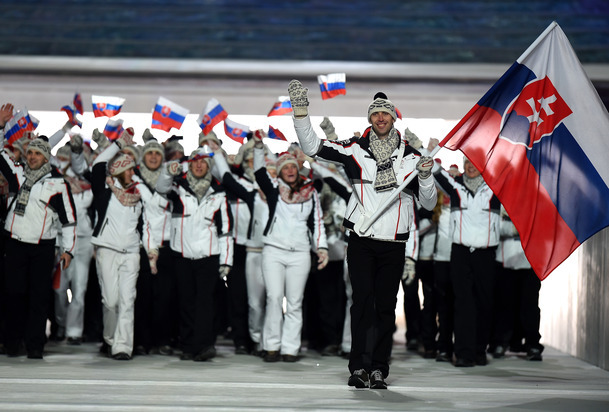 Appearing in his third Olympics, Bruins captain Zdeno Chara was allowed to leave early for Sochi where he was the flag-bearer of his native Slovakia during the Opening Ceremonies. Following the conclusion of the Bruins game with the Ottawa Senators early Saturday evening, Patrice Bergeron, Loui Eriksson, David Krejci, Tukka Rask and coach Claude Julien will head to Sochi, Russia to join captain Zdeno Chara for the 2014 Olympic Hockey Tournament. Chara, the captain of the Slovakia National Team was granted a two-game leave from the B’s so he could serve as flag-bearer for his native country during the Opening Ceremonies. This will be Chara’s third Olympics, all while playing for the Bruins, breaking a tie with Per-Johan Axelsson for most Olympics as a Bruin. There has been at least one Boston representative at every Winter Olympics since the NHL began sending its players to the Games in 1998 at Nagano, Japan. That year the only Boston player at the games was Raymond Bourque who came up short of a medal for the disappointing Canadian squad who were favored at the start but lost a chance at a medal by dropping games against the Czech Republic and Finland. Since, Bruins have brought home a total of six medals—two gold, three silver and a bronze. 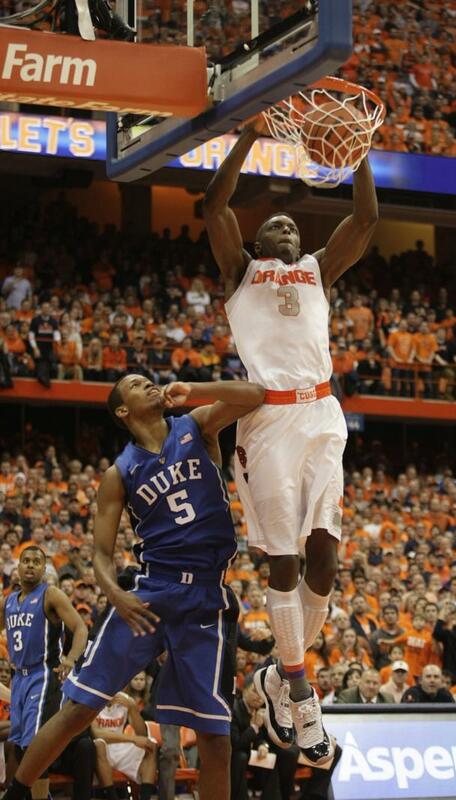 Will Jerami Grant and the top-ranked Syracuse Orange win someone a billion dollars on April 7? What would you do with a billion dollars? Unlikely as it may seem, in March you'll have the opportunity to enter a bracket that will potentially win you roughly the GDP of the Solomon Islands as part of the Quicken Loans Billion Dollar Bracket Challenge, backed by Berkshire Hathaway patriarch Warren Buffett. All you have to do is correctly predict the outcome of every game in the upcoming NCAA Division I Men’s Basketball Tournament, something that has never been achieved. Given the 9.2-quintillion-to-one odds, the chances of seeing a winner are beyond infinitesimal, but since this is a stats blog, I wanted to see if there was any way to use the numbers to get an advantage when chasing the billion dollar brass ring. Stats Driven: What was your initial reaction to hearing about the billion-dollar challenge issued by Warren Buffett? Are you going to give it a try? Bowen Kerins: My first reaction was that they must be very, very certain that no one will win. My second reaction was to wonder if it was possible to sign up with every possible bracket. It isn't. SD: What makes it so difficult to pick a perfect bracket? What's the best you've ever done? BK: To get a perfect bracket, you must predict every single upset, and know just how far each Cinderella team lasts. Who could predict VCU-Butler as a Final Four matchup in 2011, or the deep runs of Florida Gulf Coast and Wichita State in 2013? To be perfect you have to guess the outcome of 63 basketball games before any of them are played. I retired from bracket building after successfully predicting #3 Stanford vs #8 URI in the 1998 Midwest final. It was never going to get better than that ... and even then I might have hit 47 or 48 out of 63 games. In 2013, there were over eight million entries in ESPN's Tournament Challenge, and the winner of that contest got 51 out of 63. Several companies in 2013 offered prizes for brackets with only one or even four errors, and none of those prizes were even close to being paid. SD: Is there such a thing as a sound approach this challenge? Or are the random "throwing darts-at-your-bracket" and "picking-the-teams-with-the-better-uniforms" methods just as likely to be successful? BK: It is possible to do better than chance alone, but surprisingly not much better. The big problem is that some game, and there's no way to tell which, is a major upset. In 2013 there was Florida Gulf Coast beating Georgetown in a 15-vs-2 matchup: only 1 out of every 50 brackets picked FGCU. Nate Silver of 538 did a pre-tournament analysis, and one big conclusion is that traditional underdogs are much more likely to win their games than they're usually given credit for. He gave Florida Gulf Coast a one-in-10 chance of beating Georgetown. Is that enough to pick them? Not really, but it says more than one out of every 50 brackets should have picked them. So my short advice for the billion-dollar bracket battle: mark all the 1s over the 16s, then flip a coin for every other game. Doing this, you'll be more likely than the average ESPN bracket builder to hit the entire tournament completely perfectly, because you'll be immune to almost any bracket-busting upsets. And don't just make a bracket with no upsets: even though this is more likely to happen than you would think, a mob of people are all going to mark their brackets this way. Imagine getting the perfect bracket and still losing the contest. Unfortunately, none of this advice is truly helpful: the perfect bracket is not going to happen. You are about 100 times more likely to hit the jackpot playing Powerball twice in a row than you are to hit a perfect bracket. Everyone in the world could learn how to pick a bracket skillfully, then submit 100 million brackets each, and there would still be less than a 50% chance that one of those 700 quadrillion brackets would hit perfectly. SD: What's your Final Four right now? BK: It's hard not to see Syracuse and Arizona going all the way, they've looked very solid. Wichita State is undefeated, their strength of schedule is almost the same as Syracuse's, and their team has deep tournament experience... so they'll lose to whoever is #2 in that region, maybe Michigan State. My fourth pick is Wisconsin: they are stronger than their record indicates and started the season on a huge roll. All I know for sure is, that will not be the actual Final Four. The Red Sox are taking a calculated risk that Grady Sizemore, not long ago considered baseball's premiere outfielder, can provide some punch at a fraction of what it would've cost to retain Jacoby Ellsbury. The not-so-Super Bowl is behind us so it's time for the 2014 baseball season to get rolling in Fort Myers for the Red Sox. Some major parts of their 2013 title team (Jarrod Saltalamacchia, Jacoby Ellsbury, Stephen Drew) are missing but Boston looks to become baseball’s first repeat champions since the 1999-2000 Yankees, and the first Red Sox team to repeat since the days of Babe Ruth, Harry Hooper and Everett Scott in 1915-16. General Manager Ben Cherington did well reloading his squad with solid replacement parts (A.J. Pierzynski, Burke Badenhop, Edward Mujica, Jonathan Herrera), and the most impactful of those moves could also be the most economical. Last month Cherington inked one-time Cleveland Indians star Grady Sizemore to a one-year major league contract for $750,000, with hopes of him competing with Jackie Bradley Jr. for time in centerfield. 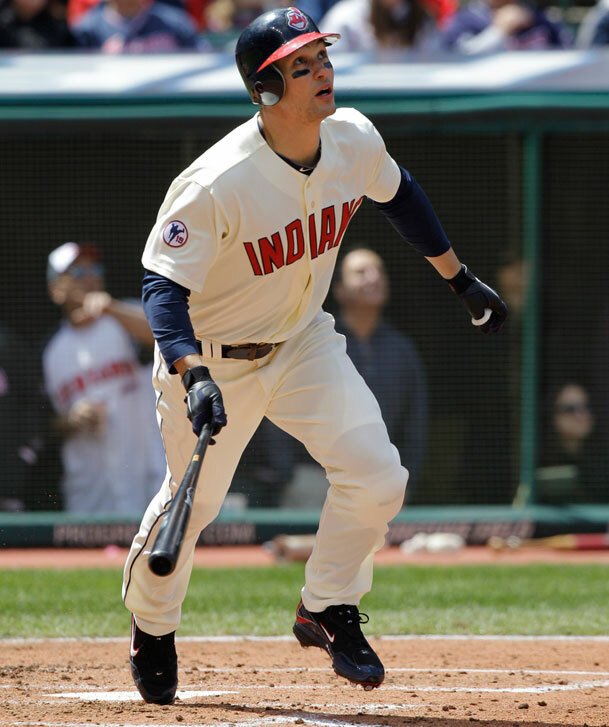 Since 2009, Sizemore, 31, has been battling a cornucopia of injuries to his groin, back, and legs that resulted in a total of seven surgeries including microfracture procedure to each knee, that caused him to miss all of 2012 (with Cleveland) and 2013 (out of baseball). Now under the watchful eye of the Red Sox medical and training staffs Sizemore is reportedly healthy again and feels ready to help fill the void left by Jacoby Ellsbury’s $153 million departure to the Bronx. A three-time All Star, two-time Gold Glove winner and 2008 Silver Slugger recipient, Sizemore hasn’t appeared in a big league game since 2011, but in 2008, his last full season, he was one of the premier players in the game placing eighth among all major league batters (and third in the AL) with 5.9 offensive Wins Above Replacement (oWAR). Using similarity scores developed by Red Sox stats guru Bill James the explanation of which is shown here, you can see how talented that Sizemore was in his prime. with numbers that compared most favorably to the output of Hall of Famer Duke Snider over his first two seasons, and drawing close comparisons to Barry Bonds in his age 25 and 26 seasons. Having taken the past two seasons off, Sizemore allowed his body to recover to the point that there’s a chance that he could once again flash some of the same skills that allowed him to become one of three players in baseball history (with Bobby Bonds and Darryl Strawberry) to reach 20 home runs and 20 steals in four of his first five seasons. Look at his contemporaries and you’ll see Sizemore’s potential. Among those who’ll be in their age 31 season are a Who’s Who of today's elite hitters, including Miguel Cabrera, Robinson Cano, Joe Mauer, Yadier Molina, Shin-Soo Choo, David Wright, and the list goes on. 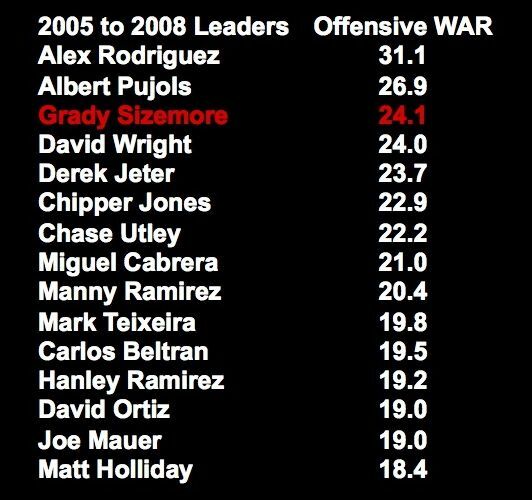 Arguably, from 2005-08 Sizemore was the most valuable of the bunch, with his 24.1 oWAR ranking third among everyone over that span behind only the two undisputed best offensive weapons, Alex Rodriguez and Albert Pujols. He and Alfonso Soriano were the only players in the game to top 100 home runs and 100 stolen bases in the same timeframe. To further illustrate how outstanding Sizemore was, over the past four seasons, only three players—Miguel Cabrera, Robinson Cano, Andrew McCutchen—have exceeded a WAR of 24. It's clear that Sizemore's development was stunted and his career sent flying off the rails by myriad ailments, but given how skilled he was, plus his fresh legs from a cautious approach to recover,y and a perfect opportunity staring him in the face with the Red Sox, there’s a chance that he could return to being a solid big league regular, if not an All Star star level talent. All at 1/28th the 2014 cost of Jacoby Ellsbury. Here are the WAR leaders from Sizemore's prime, illustrating some of the company he kept and hopes to join again, this time for the Red Sox. The hope for Celtics fans is that their team fares better under Silver (left) than it did under Stern. 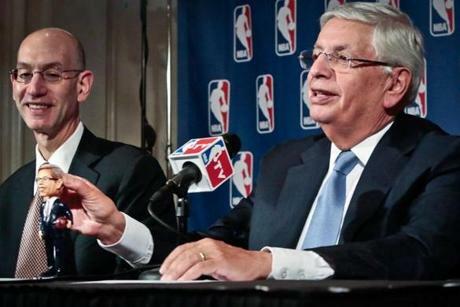 On Saturday the most powerful commissioner in professional sports history, David Stern, handed over the reins of the league to his right hand man of the past two decades, Adam Silver, ushering in a new era. Compare the league today to the one Stern took over from Larry O’Brien, and you’ll see just how far he took a once-failing business model and transformed it into the worldwide powerhouse that it is today. To illustrate just how the league has prospered under Stern, consider these facts culled from this article. The average value of one of the 23 teams he inherited in 1984 was $17.4 million for a total of $400 million. The least valuable franchise, the Milwaukee Bucks, is valued in 2014 at $405 million by itself, with three teams, the Knicks, Lakers and Bulls all worth more than a billion dollars, bolstered by personalities like Larry Bird, Magic Johnson and Michael Jordan and a global marketing initiative that not only made the aforementioned players some of the most recognizable athletes on the planet, they became some of the most recognizable people on Earth. There’s absolutely no disputing the fact that David Stern was a godsend for the NBA as a whole, but strictly from Boston’s point of view, the Celtics franchise was actually on the decline during the most of Stern’s 30 years. In fact, they averaged just one title per decade and won games at a lower rate under Stern (.545) than any of his predecessors, and suffered through 12 of the 19 losing seasons in franchise history under Stern. Here’s Boston’s record by Commissioner, crediting each with a full season during their transition years. 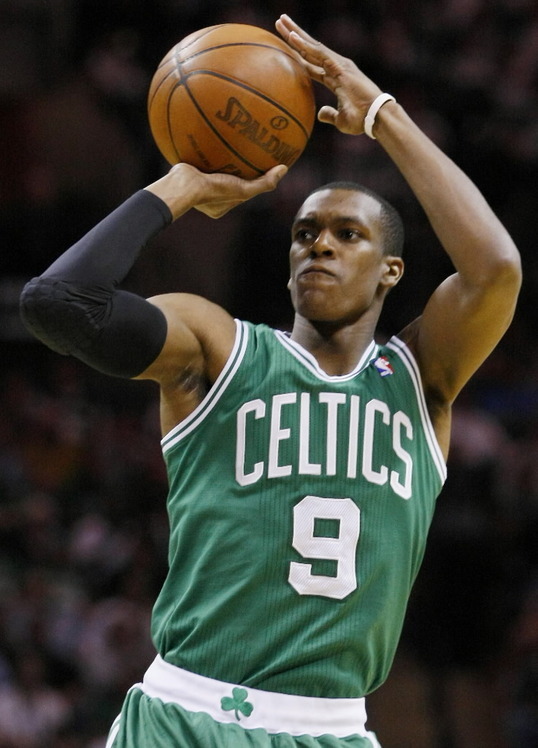 Celtics captain Rajon Rondo has yet to experience victory since returning from his year-long absence.